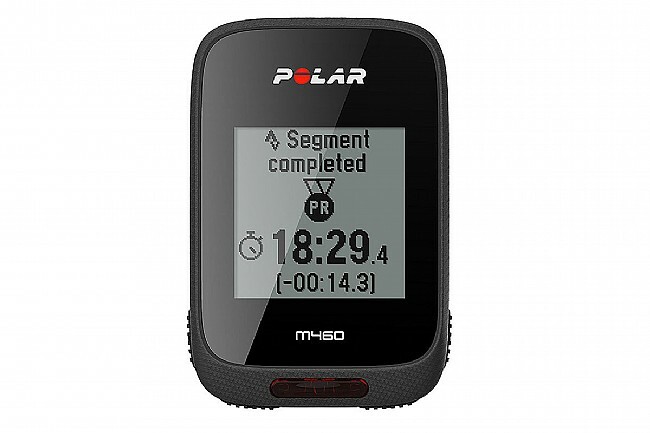 Training the right way just got a whole lot easier, thanks to the Polar M460 GPS Cycling Computer. The M460 delivers the same fully-wireless performance of the M450 that cyclist's love, this new version now displays Strava Live Segments, displays smartphone notifications, and adds support for power meters. The Polar M460 GPS computer delivers a completely wireless riding experience, calculating speed and other riding metrics from the latest in GPS tracking, paired with a built in barometer for further precision. The Bluetooth® Smart connectivity means you can pair the M460 with Polar's line of accessories, or any compatible 3rd party sensors, heart rate monitors, or power meters. 64 MB of onboard memory stores up to 35 hours of riding data, and the USB-rechargeable battery lasts up to 16 hours in one session. A front white LED can be toggled on or off to improve visibility for when your rides go a little longer than expected. To make things as easy as possible, the Polar Flow app allows you to wirelessly upload your data when paired with your smartphone. Includes handlebar mount and Micro-USB charging / data cable. Display size is 3.5 cm x 3.5 cm. Wireless ride data uploads to the Polar Flow app. GPS location recording, derives speed and gradient. Pushes notifications from smartphone to the M460's display. Smart Coaching: Fitness tests, training load measurement, and recovery calculator.